The image released alongside Bungie's announcement of the Halo film in 2004. "If we ever make a Halo movie, who would you want to write it?" I asked Marty as we exited the theater, "I bet that Garland guy would be all over the Flood." — Joseph Staten, after watching 28 Days Later. The Halo film, officially confirmed in 2005, was a film project in development until its ultimate cancellation in 2006. The film, intended to be produced by Peter Jackson and Fran Walsh and directed by Neill Blomkamp was postponed indefinitely when funding studios 20th Century Fox and Universal Pictures pulled out due to monetary concerns. The Halo film was to be filmed in live action with special effects, along with props and costumes, created by WETA Workshop and WETA Digital. WingNut Films, a New Zealand-based production company known for collaborating with Jackson on The Lord of the Rings trilogy, were also to be a part of the project. It was later revealed that the film would have been shot in Wellington, New Zealand, and was slated for a summer 2007 release. Halo: Landfall, a promotional series for Halo 3, was composed of test shorts filmed by Blomkamp during the Halo film's early production. When plans for the film eventually fell through, Jackson and Blomkamp instead started production on District 9. Many elements from the cancelled Halo film were re-used or adapted for District 9, including the basic Warthog and Pod infector designs. In February, 2005, Creative Artists Agency confirmed that Microsoft had completed a $1 million deal with Alex Garland, the British screenwriter of 28 Days Later, to write the Halo screenplay, which would then be offered to studios. On June 7, 2005, Microsoft released Garland's completed screenplay to various Hollywood studios on, looking to be paid a $10 million fee as well as the studio's agreement to adhere to guidelines set by the game's developers. Microsoft also wanted the studio to seek approval over the director and cast. In addition, Microsoft sought full merchandising rights for itself, a minimum $75 million budget, and company representatives' full access to the film's rough cuts in Los Angeles. Most potential studios - namely Paramount, DreamWorks, Sony, and Warner Bros. - did not want to cede creative rights to the film and passed over the project. 20th Century Fox and Universal Studios entered negotiations with Microsoft to divide the distribution rights to Halo. The original $10 million deal was reduced based on the studios' negative response to the exorbitant price tag. All negotiating parties eventually agreed upon a deal to produce the Halo film; it was decided that Universal would distribute domestically, and take sales from the U.S. box office, while Fox would take the international distribution - with both co-financing the film. The studios agreed to give Microsoft $5 million to option the film, and 10% percent of grosses. On August 22, 2005, the deal was announced to be finalized, with summer 2007 as the target release date. On October 4, 2005, Bungie announced that Jackson was signed onto the project as executive producer. In July, 2006, author D. B. Weiss announced that he was working on his second draft of the new script for Halo, which contained elements of the project's original screenplay by Alex Garland. Other screenwriters, namely Scott Frank and Josh Olson were also attached to the rewriting of Garland's script. 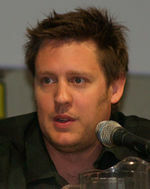 In August 2006, Jackson and the studios announced that Blomkamp would direct the project, for a smaller fee. Microsoft originally wanted Jackson to direct, however Jackson's fee was already running into several millions of dollars. Blomkamp stated he was confident that Bungie liked the initial concept art for the project, however Microsoft were afraid the material might be too unconventional for a summer blockbuster. Universal had already funded $12 million for preliminary development; a portion of this spent by Guillermo del Toro (attached to the process before Blomkamp), with the rest having been spent hiring the various writers to redraft Garland's screenplay. In October 2006, Universal proposed a reduction in the producers' fees. Jackson consulted with Microsoft, his co-producers, and Blomkamp, but ultimately refused the deal. Universal and Fox subsequently removed themselves from the deal. Blomkamp and Jackson have both cited money and control as their main reasons to abandon production. On October 29, 2007, Ken Kamins, a representative of Jackson, confirmed in an interview that the Halo film was still in pre-production. According to Kamins, Blomkamp had not been dropped - in spite of his earlier statements. In April, 2008, Stuart Beattie, an Australian screenwriter best known for his work on G.I. Joe: The Rise of Cobra, was reported as having written a screenplay for Halo in 2007 - adapting Eric Nylund's Halo: The Fall of Reach. Beattie is quoted as saying; "It's not something I can direct right now, because it's a big $100 million-plus film... [but] I would just love to see a Halo movie up there on screen. It's magnificent." In August, 2009, Blomkamp revealed that the film's budget would have been $120 million. On August 10, 2009, Steven Spielberg was reported to have been "blown away" by Beattie's screenplay, and was in "active negotiations" to produce a future Halo feature. On August 11, 2009, Microsoft responded to the above report, claiming it was "glad" of the enthusiasm surrounding a Halo feature, although the project still remains on hold. On October 6, 2009, Frank O' Connor confirms that Microsoft is still "being very careful to pick the right time and the right partner" with regards to a new Halo feature. In 2010, O' Connor states that Microsoft will make a film "when the time is right", and that it would be a standalone story rather than "a verbatim retelling of the game". O' Connor also hinted at a future live action miniseries, which would later be revealed as Halo 4: Forward Unto Dawn. On July 14, 2017, Blomkamp states that he is still open to doing a movie, but Microsoft has not approached him. O' Connor subsequently states that Microsoft would "be delighted to work with him [Blomkamp] again one day. On October 5, 2012, the first feature-length film set in the Halo universe, Halo 4: Forward Unto Dawn, was released. On April 10, 2013, Blomkamp announced he is still interested in directing Halo, but only if given more creative freedom. On May 21, 2013, a Halo television series, produced by Stephen Spielberg, was unveiled alongside the Xbox One at E3 2013. On April 28, 2014, 343 Industries and Microsoft revealed a digital feature produced by Ridley Scott, officially announced at E3 2014 as Halo: Nightfall. In the DVD commentary for Hellboy 2, Guillermo del Toro states that he did a design of Master Chief for the Halo movie. He describes Master Chief's helmet as being "sleek and self concealed". Excerpt from the story and style companion booklet from the 2005 movie project. A fully functional (presumably, the turret does not work), drivable Warthog made by WETA Workshop. Bungie employees "hunting cougars" outside the studio building with WETA-made replica weapons. A scene from Halo: Combat. ODST helmets in Arms Race. An ODST kills a Brute in Combat. Two Brutes attacking with spikers in Last One Standing. A poster for Halo 4: Forward Unto Dawn, a non-theatrical Halo film. A fully functional Warthog has been produced by WETA workshop as part of Halo: Landfall short films by Neill Blomkamp. ↑ FirstShowing: Stuart Beattie Wrote His Own Halo Script to Sell! 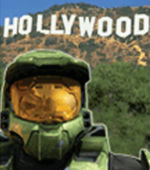 ↑ Kotaku: Steven Spielberg To Produce Halo Movie? ↑ Kotaku: Microsoft: Halo Movie Still "On Hold"